Mark LeVine is a professor of history at the University of California, Irvine and Distinguished Visiting Professor at Lund University’s Center for Middle Eastern Studies in Sweden. His most recent book, with ambassador Mathias Mossberg, is One Land, Two States: Israel and Palestine as Parallel States (UC Press, 2014). 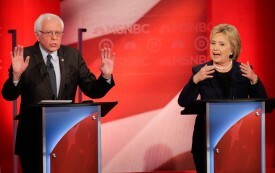 Who’s Really the Better Friend to Israel, Hillary or Bernie? Bernie’s better, but, sadly, neither candidate is acting the way a true friend should.